I love glass and I love trees. 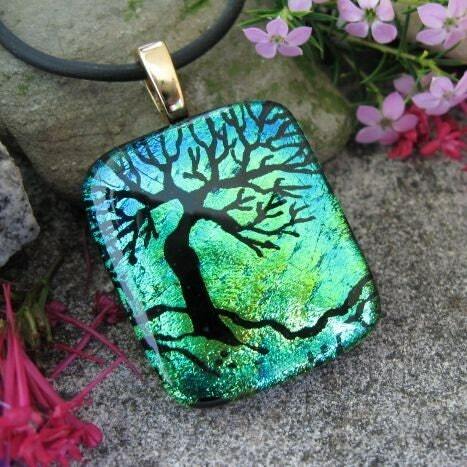 A while back, the avatar of an Etsy seller caught my eye~ a dichroic glass pendant of a tree. Well, now. So I bought myself a little Christmas gift (blue/green pendant below) from Deborah at Unique Dichroic in SW Western Australia. Dichroic glass is glass containing multiple micro-layers of metal which give the glass dichroic optical properties. Dichroic glass was originally developed by NASA and its contractors for use in satellite optics and spacesuit visors. My little pendant is the one pictured at top, and here is a little sampling of Deborah's current work. Enjoy! I've been a fan of dichronic glass for a long time and have several pieces. Never seen anything quite so beautiful as this artist's work though. Thanks for the reference. 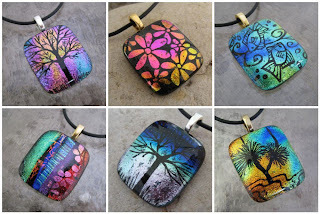 These pendants are stunning! The colors... the design... very wearable art. You are a lucky girl to have one of these pieces!